Typically, the manifold would be used for adding an underfloor heating circuit to an existing system such as in a conservatory or extension. Supplied in 1”, complete with automatic air vents, drain and fill valves and end caps. 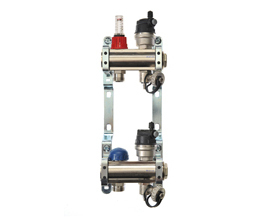 Provided with a single, integral double regulating flow meter. Can be surface mounted, concealed in a cabinet or within a partition wall. Manifold flow and return outlets are offset. Also available are ball valves, Monoblocco pipe connectors, electrothermic actuators and matching zone controls to meet or exceed Building Regulations Part L requirements. The SLM manifold is designed to allow the connection of an underfloor heating circuit with individual time and/or temperature control of the circuit. Using an Emmeti T3 Control Set with the SLM Single Loop Manifold will allow the primary flow and return temperature to be controlled to a temperature suitable for underfloor heating if a low temperature heat source is not being used. The SLM manifold is equipped with an electrothermic valve body for use with Emmeti standard electrothermic heads which allow electrical control of the circuit either by a programmable or standard thermostat. Used with a four-wire electrothermic head which includes an auxiliary switch, this also allows electrical interlock with the boiler and pump as required by the Building Regulations.